I’ve got it all over Jane Goodall. To make friends with wildlife, she had to go to the deep, dark jungles full of crocodiles, tsetse flies, tents and very poor room service. All I do is go home. My friend Shelby and I trekked down south a few weeks ago to pick up Nikki the Tikimaus and The Princess Lola. We returned with two carrierfuls of terrified kitten yowling to be let O-U-T. We set the carriers on the floor of the cat isolation center (AKA the laundry room), unfastened the doors and stepped back, expecting to see two furry streaks running past. Nope. Now the carriers were the safest, most snuggly places on earth. The kittens steadfastly refused to emerge for three hours, hissing and spitting if we came near, and spent the next three days hiding. And I learned the first of several important lessons: Pick a typical kitty trait, triple it, and you have a Savannah. Nikki and Lola are Savannah kittens, a type of hybrid cat. That means that although they’re fully domesticated, gentle and friendly, there’s an African serval in their ancestry. A year or so ago I didn’t know such things existed, but apparently it’s not all that unusual for a “smallcat,” i.e., a small wildcat, to interbreed with domestic cats. When people assist, generally to create wild-looking cats and help reduce the trade in exotic animals, they call the result a hybrid cat. These are fairly new breeds, and Savannahs in particular seem to have a lot of variations. My two probably exhibit the far ends of the Savannah spectrum. Lola is white with silver and black spots; an aerodynamic super-athlete who never stops playing and takes awhile to warm up to strangers. She can easily leap over my head, and she’s very into problem solving. If you don’t give her puzzles to work out, she’ll go make her own. Nikki is a month older, is smaller and quieter than Lola. Although she’s a second-generation (F2) Savannah and therefore should be huge, a quirk in her genetics will probably keep her tiny for the rest of her life. She looks like a miniature bobcat, dark brown, grey and black, with chinchilla-soft fur where Lola’s is a bit wiry. And where Lola is skittish, Nikki is the social butterfly, always wanting a pet or three. Nikki has about four times as much serval blood as Lola, which apparently contributes to radically different temperaments. Nikki doesn’t play, she hunts. Lola meows like a Siamese; Nikki chirps like a serval. Nikki, too, is a problem solver, but where Lola experiments until she gets it right, Nikki considers awhile, then does it. Both are packrats, snatching anything they fancy and carrying it off to a stash. Lola likes eyeglasses, underwear and tools. Nikki prefers rugs, empty containers and glass pendants–I caught her dragging Dolores Barrett’s beautiful orb necklace and nearly had a heart attack. We’ve been getting to know each other, and I’ve been learning a lot about catproofing a house, raw food diets (I’d tell you about how we discovered that these two don’t tolerate commercial catfood well, but it would definitely be TMI), and the rapid, collaborative editing of my art collection. More on that later. In the meantime, I’m getting kinda attached to these guys. The Bengals trained by Jim in Pioneer Square (left) came from studies done on offspring of wild Asian Leopard Cats and domestic cats, I’m told, which occurred naturally in the wild and frequently happened in zoos around the world. A lady named Jane Sugden, appalled by the decimation of big cats for the luxury trade, reviewed the studies and decided to create a “rosette-spotted domestic cat” to satisfy richfolk appetites for exotic-looking pets. As aside benefit, she figured that people would be less likely to buy fur coats if they resembled the neighbor’s cat. 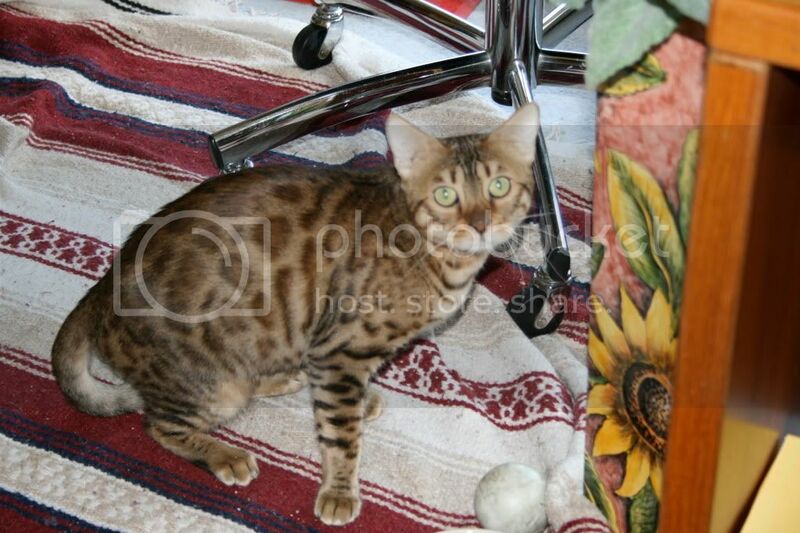 The result was the Bengal cat. Bengals led to the bigger and wilder-looking Savannahs. which descend from a cross between a serval and a Siamese cat. Servals look like miniature cheetahs, with short, fat tails, huge ears and tiny heads on long, rangy bodies. Like Asian Leopard Cats, they have been known to mate with domestic cats in the wild, but that’s less likely to happen than with Asian Leopard Cats. Savannahs are the biggest of the domestic cats, very long-legged, although each successive generation away from their serval ancestor shrinks them back toward domestic size. Like servals, they exhibit lots of different coat colors and patterns. The ones I’ve met so far are more like dogs than cats, extremely social, very intelligent and apt to do stuff like leap 8 feet from a standstill or try to balance on the tops of doors. They often chirp instead of meow, they like to solve puzzles and walk on leashes, and as far as mice are concerned, they’re superpredators. Like their wildcat ancestors, they frequently lack a protein in their saliva that is responsible for some human allergies to cats. 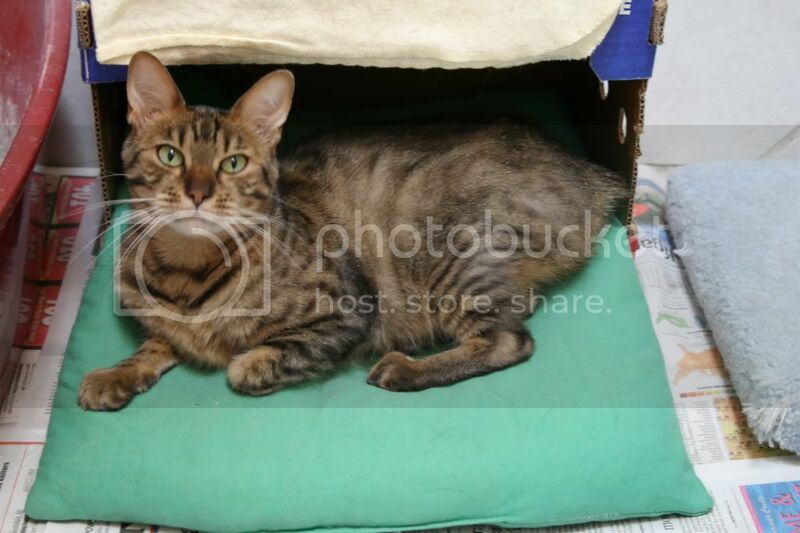 I must admit ambivalence about the whole hybrid cat-on-purpose thing when so many domestic cats need homes (and I expect to take a bunch of flak for making this choice). But I do love the personalities of Savannahs, and these two–the great-great-great-something of that initial Serval/Siamese cross–needed a home. I hope that they will exhibit enough of the other Savannah traits (especially the no-allergy part) so that they can finally become part of my family. Dee, at this point it’s anyone’s guess–Savannahs also show a lot of variability in size, and they apparently can take up to 3 years to achieve full growth. Typically, the more distant the generation is from the serval, the smaller the cat, so an F2 like Nikki should be much bigger than an F4 like Lola. Nikki, at 8 months, is a month older than Lola yet quite a bit smaller. She’s about the height of a 5-6 month old kitten right now, and judging from the size of her paws won’t be getting a lot bigger. Lola is at least the height of a full-grown cat now (at 7 months), growing very fast and her paw size hints that she’ll get much bigger. She can jump onto the tops of tall cabinets; Nikki’s already too short to follow her. So who knows? Nikki could suddenly develop a growth spurt, or Lola could just be a big-footed cat. We’re kinda taking it as it comes. Have the kitties taken care of Nate? i have 2 rescues: a purebred bengal and a bengal/manx. they both exhibit the same type of behavior and are both very smart. one figured out this weekend how to open closed bedroom doors by jumping high enough to turn the knob.